This is a programmable microprocessor based isolated signal transmitter. Equipped with DIN rail mount. There is no need of an external loop power to configure. Delivers excellent accuracy in total ambient temperature range. The fault signal on the sensor break can be set by the operator. The dimensions of the transmittes are 75mm(W) x 87mm(H) x 18.5mm(D). The isolation is 4KV for one-minute between sensor input and the 4~20mA loop. There is electromagnetic compatibility that conforms to EN 50081-2, EN 50082-2 standards. V, mV, mA, PT100Ω and Thermocouple are the inputs available. The thermocouples are built according to IEC 60584-1 (ITS-90) standards. The excitation current is at PT100, with 180µA temperature, 2 or 3 wires for connection, an alpha of 0.00385 and built according to IEC 60751 (ITS-90). 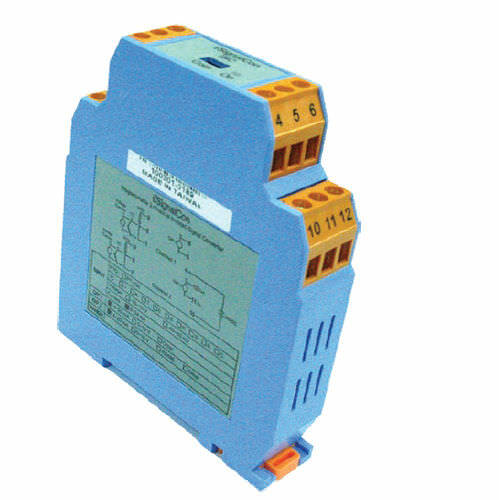 The voltage range is either -60mVDC to 60mVDC or -10VDC to 10VDC. The available current range is 0 to 24mAdc.